Max Power: 600W. 1 x Audio Amplifier Board. Rated Power: 150W. Power: 10A. USA, Canada, United Kingdom, Austrilia, France, Germany, Spain, Ireland, Italy, Others. Canada, United Kingdom, Austrilia, France, Germany, Spain, Ireland, Italy, Others. 1 x Car Audio Amplifier Board. - Strong heat dissipation power drawing technology is compact. - With current protection, overload protection, short circuit protection. - High efficiency, wide frequency, high tone quality. Trending at $25.64eBay determines this price through a machine learned model of the product's sale prices within the last 90 days. 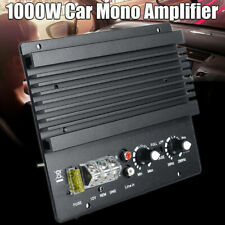 This mono 1000 Watts Car Audio Amplifier gives you a wonderful in-car entertainment.100% Brand new and high qualityCurrent /Amperage Overload, Short Circuits, Thermal Overload, DC OffsetModel: PA-80DMax Power: 1000WRated Power: 600WTHD: Less than 0.01%Frequency Response: 30Hz~280KHzOperating Voltage: 12VImpedance: 4ohmSNR: 105dBAWiring: 1, Speaker connection: amplifier board has a good piece of red and black wire welding can be accessed by a 4-8 Euro 100-150W bass or full-range speaker or speakers (red pick horn , black pick speaker - is recommended to use 4 ohm 8-12 inch 45 core 100-170 magnetic bass ) ;2, Power connectionA. car has a CD player: GND then negative vehicle power;12V power supply connected to the car 's positive ; REM CD player connected to . Soundstorm Ev3000d 3000w Class D Mono Car Audio Amplifier Amp 3000 Watt. Max power: 1 ohm 3000W X 1. RCA Line Outputs for system building. Input sensitivity selector. Variable low pass filter: 50 -150Hz. Parameters: Rated output: 600W 4Ω impedance; 1000W 2Ω impedance Maximum peak: 2000W Size: 35*24.5*5.2CM Features: * output port: 4 port output. * it is convenient to connect two bass speakers at the same time. * single push bass does not need bridging, can easily push a 12 inch speaker * can push two single coils and 12 inch bass speaker. * with line control tone function. 3400 Watt x 1 Channel @ 2 Ohm. 3400 Watt Max. 2000 Watt x 1 Channel @ 4 Ohm. 1 Year Warranty. Signal to Noise Ratio: >100 dB. THD: 0.01%. Max Power Hi/Low Pass Crossover. Max power: 1 ohm 5000W X 1. RCA Line Outputs for system building. Input sensitivity selector. Variable low pass filter: 50 -150Hz. Variable subsonic filter: 15 - 40Hz. Max power: 4 ohm 2200W X 1. THD at RMS output 0.01%. Small Compact 4¾” Wide x 1?”. High Chassis. Power Handling High Level Inputs. 2-Ohm Stable Class D Monoblocks. T erms and Conditions 50-250Hz Variable 12dB LP Crossover. 900 x 1 RMS @ 2 Ohms. Max power: 1000W. 1x 1000W car amplifier. Working Type: Mono Channel Class D. 16.Low-frequency signal gain: 12dB. Audio input level value: 200mV. Input sensitivity: 0.15~6V. Input impedance: 10K. 1x High level input cable. Features: Wire drawing technology make a fashion look. Surface mounting technology, showing neat outlook and firm welding points. High power and good performance, low noise and distortion. Parameters: Operating voltage: DC 12 volts above 20A. Installation size: 20.25*16*6 cm Panel size: 22.5*18 cm Peak: 500W Rated power: 250W Features: * Adopt four high-power parallel output power *Maximum output power 1000W, can push a 6-12 inch bass speaker * Mono Pure Bass Amplifier Board. 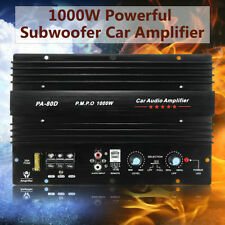 12V Mono Car 1000W Audio High Power Amplifier Board Powerful Bass Subwoofer Amp. 1 x Car Audio Amplifier Board. battery, can not in the car just to find a positive line connected, or burned out car circuit. 600W Mono Car Audio Power Amplifier Powerful Bass Subwoofers Car Amplifier Board. Max Power: 600W. 1 X Car Audio Amplifier. Kitchen & Bar Supplies. Hand Tools. Rated Power: 150W. SNR: 105dBA. Frequency Response:30Hz~280KHz. 600W Mono Audio Power Amplifier Bass Subwoofers Amp PA-60A Car Amplifier Board. Max Power: 600W. 1 X Car Audio Amplifier. Actual Power: 100W. Treble: Unlimited. HIFI power bass subwoofer amplifier. 1 x HIFI Car Amplifier. directly with the battery (battery) connection : GND connect the battery negative, 12V and 12V REM then the positive battery simultaneously. Boss Audio R1100M - RIOT 1100 Watts, Mosfet Monoblock Power Amplifier. MOSFET Monoblock: R1100M. Max Power: 2 OHM 1100W X 1. Blue Illuminated BOSS Logo. THD: 0.01%. Peak Power: 1000W. - Powerful bass. - 1 x Car Audio Amplifier. B. Car no CD player : GND connected to the negative power of the car, 12V and REM connected together in positive 12V car power ( 12V can also be an indirect. ). Parameters: Rated power: 1 channel *200W Peak power: 1*1000W Output resistance: 4-8Ω Power amplifier tube: 2*original C5198 2*original A1941 Features: * can push 10 inches or less than 12 inches bass speaker * high density double color loop * KINGBOX capacitor * two groups of Toshiba pair tube. 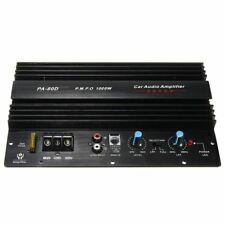 Car Audio Amplifier is made of high quality aluminum and durable material. 1 Car Audio Amplifier. Material:Aluminum. Notes: The real color of the item may be slightly different from the pictures shown on website caused by many factors such as brightness of your monitor and light brightness. Actual Power: 80W. 4.Built-in high quality tweeter. Support TF / U disk / AUX audio input. Treble: Unlimited. 1 x HIFI Car Amplifier. Max Power: 150W. Support up and down the song switch, play pause function. 1 x Car bluetooth amplifier. D type amplifier. Play MP3 music from TF card, U disk, bluetooth. Output power: 30W. Maximum power: 50W. 1 x Power line. Frequency response range: 20-20000. Sensitivity: 200 hv. 1 X Car Bluetooth Amplifier. Support type: MP3, TF card, U disk, Bluetooth. Compact appearance and efficient output give you a perfect listening experience. Provide stronger and more powerful sound. Max Power: 1000W. C. directly with the battery (battery) connection: GND connect the battery negative, 12V and 12V REM then the positive battery simultaneously. Rated Power: 600W. 2, Power connection. 12V 1000W Mono Car Audio High Power Amplifier Board Powerful Bass Subwoofer Amp. Peak power: 1000W. 1 Amplifier Board. With current protection, overload protection, short circuit protection. Strong heat dissipation power drawing technology is compact.